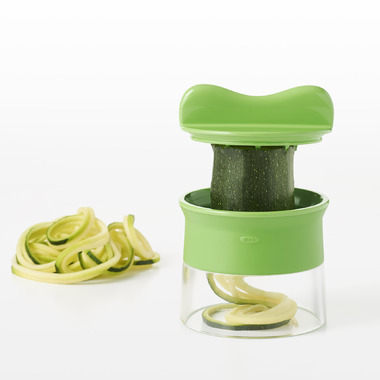 OXO Good Grips Hand-Held Spiralizer creates uniform, curly noodles from vegetables for healthier meals. The open blade design accommodates both long vegetables like zucchini and round vegetables like potatoes. Convenient food holder keeps hands safe and acts as a cap for storage. Food holder is easy to grip and slices down to the end of vegetables to minimize waste. Easy to use. Noodles come out round and perfect compared to flat with other products like this. I would highly recommend! I like this product because its easy to store and it does its job. 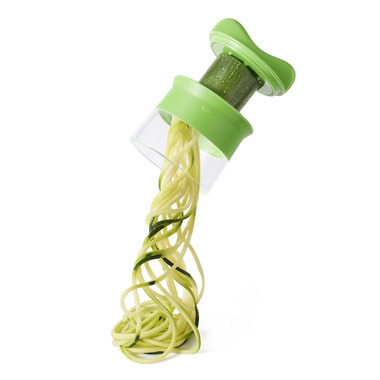 I use it with zucchini to make noodles and works perfectly fine! The only thing is that it is difficult to clean, but if you have time on your hands, then you can clean it thoroughly. So I've only used this gadget a few times since buying but it seems to do the trick. It's fairly easy to clean and doesn't take up too much room in the cupboard.